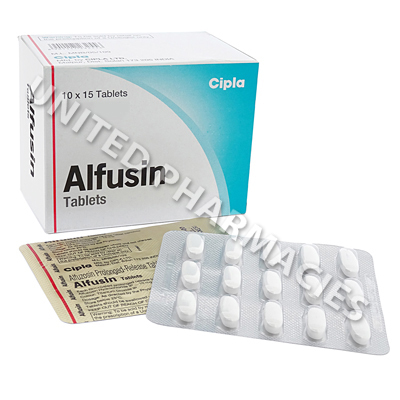 Alfusin (Alfuzosin HCL) belongs to a class of drugs referred to as alpha blockers, and is prescribed for the treatment of an enlarged prostate gland (referred to by doctors as benign prostatic hyperplasia). Treatment with this drug helps to cause the relaxation of certain muscles in the bladder neck and prostate, which in turn can ease the flow of urine. 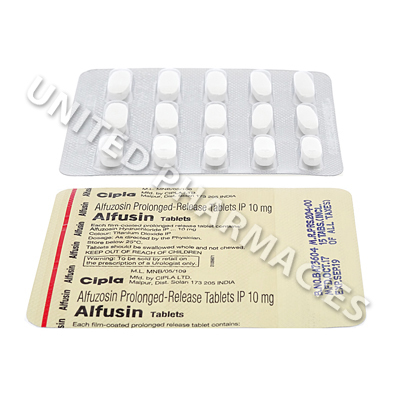 Alfusin (Alfuzosin HCL) belongs to a class of drugs referred to as alpha blockers, and is prescribed for the treatment of an enlarged prostate gland (referred to by doctors as benign prostatic hyperplasia). Treatment with this drug helps to cause the relaxation of certain muscles in the bladder neck and prostate, which in turn can ease the flow of urine. As a result of this, symptoms such as a weak stream of urine, the need to urinate during the night and trouble starting a flow of urine may be improved. In some cases, this medicine has been prescribed to patients with kidney stones. Alfusin (Alfuzosin HCL) comes in the form of tablets. Patients should follow the dosage instructions given to them by their doctor. Adult men treating benign prostatic hyperplasia are sometimes instructed to take 10mg per day, immediately after eating a meal. It should be taken at the same time every day, and should not be taken without food. You should inform your doctor if any side effects occur. Seek medical care straight away if you notice a painful erection lasting for a prolonged period of time, fever, severe dizziness or any other serious symptoms. This medicine should not be used as a treatment for high blood pressure. Women must not take this drug, as it is only prescribed to treat men. Always use Alfusin (Alfuzosin HCL) as you have been prescribed by your doctor. Never self-medicate or change your dosage without first consulting your doctor. The correct dosage can vary depending on your health, medical history, and the severity of the condition being treated.